The Commission for the Arts has awarded the Northampton County Education Foundation a grant to help support an upcoming concert benefiting the Foundation’s work in Northampton County Public Schools. The concert will feature the Wren Masters from the College of William & Mary, an early music quartet, playing renaissance and baroque music on period instruments. 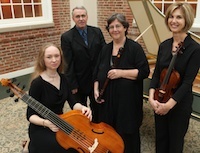 Hailed by the Washington Post for their “crisp ensemble, mellowness, and admirable stylistic awareness,” the four members are performing artist faculty of the College of William & Mary, playing harpsichord, baroque violin, viola da gamba / baroque cello, and recorder. The concert will be held May 3, at 3 p.m. at Franktown United Methodist Church. Tickets are $20 and go on sale March 16 at The Book Bin in Onley and any Rayfield’s Pharmacy. While I applaud the efforts of the Commission for the Arts and NCEF to expose 25 of Northampton county’s schoolchildren to this experience, perhaps they should consider bringing the group to perform in one of our schools so that many more kids may have a chance to hear this music. Assuming that only those children already involved in a music program will benefit excludes kids who may not ever have heard a live musical performance of any kind.